Aww! I clicked over to read about your pantry and was so honored and surprised when you mentioned me! Feeling a little guilty now that my desk area– and the whole room it's in– is in need of some serious TLC right now. So… YOU have inspired ME! Hey, fun, thanks for the shout-out. And I started Lisa's book yesterday, too!! I love, love it. She's such a fabulous writer! If I could be one item in the pantry, I'd pick Nutella–it has to be the happiest of all pantry items! You're welcome! I agree, she is a fab writer! Oooh, Nutella! Great choice! School doesn't start for us until September! Oh, and I still think it's crazy we don't start for another month yet…if not longer. We've also got a month–don't start till after Labor Day:) But I did start my cleaning yesterday…got one kid's room summer cleaned b/c I completely missed spring cleaning. I want to be chocolate…b/c who doesn't love chocolate??? Um, sadly, we are not on a school schedule around here. Every day is like school is in session because I have to work just the same in the summer. Is it bad that I look forward to having kids so I can have real summers again? Probably. And I'd be peanut butter, because everything is better with peanut butter. Creamy, not crunchy, thank you very much. I didn't clean out my pantry this week … but I did dive into my jewelry box, which has been ignored for decades. Ah, the fashion trends that can be recalled in pairs of earrings! What item would I want to be in the pantry? Love this question: How about that delicious treat, Nutella — just perfect for grabbing a spoon and sneaking a taste when your up late and working on rewrites! My house SOOOOO needs a cleaning. Everywhere. In every corner. I find myself SO distracted by having the kids home (but they're AWAY AT SLEEPOVER CAMP next week – so maybe??). Cleaning. What is this word, cleaning? Can you 'splain it to me? I do not know this word. I love this – you inspire me. And I'm actually in the middle of… what for it… no WAIT for it… SETTING UP MY VERY OWN WRITING WORLD! Our daughter got married last year and vacated her room. Then we had a young man living with us until April, then we had company, then we had relatives visiting over the summer. BUT now (I can hardly stop giggling ecstatically!) I'm taking the room for My. Very. Own. Writing World. Bookshelves, books, my pretty things, my desk, computer, thinking chair. And yes, one teeny-tiny shelf for bills that need to be paid at some point. Now I have to head over to Amanda's desk for ideas. Tee-hee! My house is a mess right now. It's driving me nuts, but I'm not sure when it will get any attention. Does school seriously start in two weeks!?!? Oh my gosh, where has the summer gone? I sort of get this need to clean and get my house in order right before edits are coming and thats right now. I love a good clean pantry 🙂 Mine has always been horrible and last year, I grabbed a sharpie, emptied my pantry and drew lines (literally like grocery isles) in my pantry. 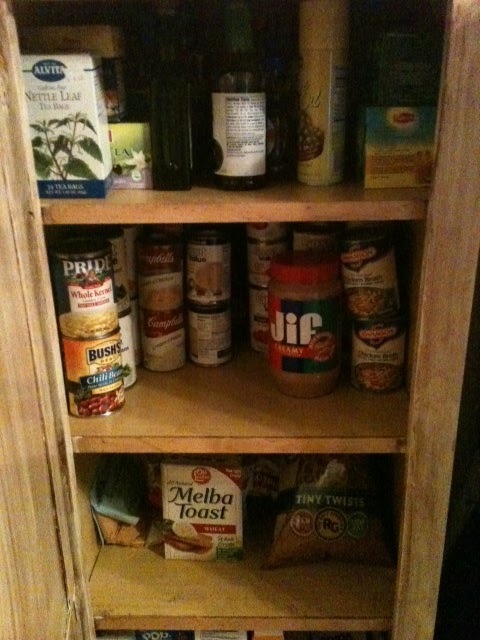 Now everything has an isle, sweeteners, beans, soup, etc. I love it and it actually has stayed that way though it's not very pretty and definitely wouldn't make the cover of a Martha Stewart magazine, LOL.